125 meters (have decided to go metric :)), just over 50g, approx 12wpi (not fully metric :P) - just a smidge heavier than i would have liked, but not bad for a first try at spinning to order. weighed out 300g total fibre, using 4 different blues and 2 pinks. divided up each colour into 6 equal pieces, then compiled 6 batches consisting of all colours (50g per batch). each batch spins up to one skein (2 ply so half a batch onto one bobbin). 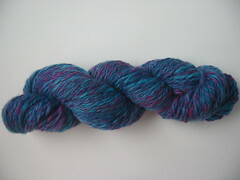 this turned out 16 rolags, some noticeably bluer, others more pink. i plied the 2 halves together to even out the colour differences, so all the pinky ones went onto one bobbin, all the bluey ones onto the other. one down, only five more to go.